A special Sound Healing session for the most powerful Super Moon of the year when the moon is nearest to the Earth. The deep healing energy of Virgo will resonate through the sounds of earthy gongs and singing bowls bringing relaxation and renewal. Surrender to the sublime sounds of sacred Gong and Himalayan singing bowls : soothing away tension and improving clarity of mind, emotions and body. Reach your point of inner stillness and outer calm with pranayama, deep relaxation and sound healing. The sound of the gong stimulates the parasympathetic nervous system (rest and digest function), clears the mind, balances emotions, strengthens nerves and restores energy. A great way to manage stress and release tensions of the day. Absolutely no experience needed to benefit from this calm and healing practice! 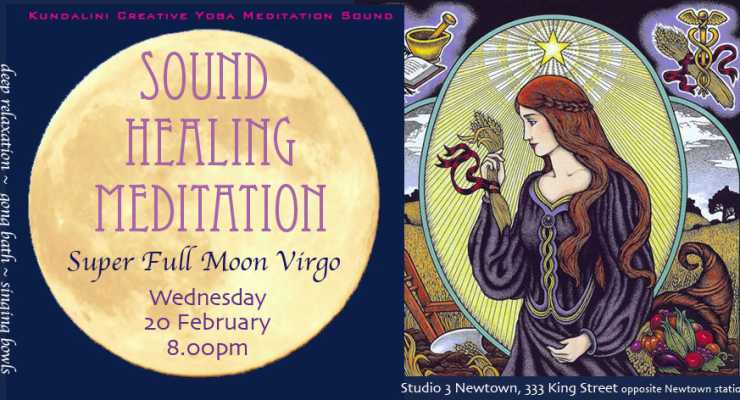 come to the Sound Healing Gong Meditation experiences held every fortnight on New and Full Moons. Or book in for a special 1:1 therapeutic sound session for a more tailored approach to your healing. Wednesday nights in Studio3 Newtown from 8.00-9.00pm during the Summer months.